Parrot Forum • View topic - Parrots not good for seniors. Parrots not good for seniors. they are right because parrots are, by far, the hardest companion animal to keep healthy and happy! Re: Parrots not good for seniors. Not to mention, seniors have fragile skin, not meant for any occasional parrot bite. Plus, parrots outlive them and may wind up among the hundreds abandoned to shelters. Hell, that is all I need is for someone to decide what pet I will have or not have. 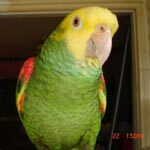 There are a lot of regular contributors to this forum that meet the "retired and senior" criteria and they have more than just a few parrots. DanaandPod check your birthdate, you´re closing in. Parjarita, you may know birds, but you don´t know all people. I will decide what pet I have not some article or people on a forum that have no idea who I am. If this offends anyone, live with it, that´s just what us seniors do, voice our opinions. 2. Pet proof electrical wires. Parrot ownership just got a whole lot easier. I don't want anyone to tell anyone what they can and cannot buy, I just want people to think about what they are doing. If you're 65 and you want to buy a baby amazon, just think about what you're doing. If you still want to do it, i can't stop you. I just hope you have a plan in place about what happens to you bird when you are gone. This is a very good point. But instead of making a blanket statement that seniors should not have parrots, why not make the statement of let me help you make a plan to care for the bird if you should go first. Face it, a 20 year old that gets a baby bird that could live for 70 years is most likely to die before the bird. So don´t make negative statements and assumptions, make positive ones that helps everyone and the birds. If you are in a position to decide who gets a parrot or not be careful. If you deny a person, then you set up a situation where that person may go to a breeder or poacher. People are gonna get what they want. The black market thrives. Even at 51, look both ways before you cross the street. Yes, but the birds I help make decisions about are OUR birds, OUR responsibility. I'm not going to put a bird in a situation that isn't good just because that person may go out and buy from a dealer. I'm sure it happens all the time. A guy came in and wanted a cockatiel. He wanted it that day, as a birthday present for his daughter. I told him we couldn't do that. We aren't a pet store. He'd have to fill out an application and go through the process. The process isn't lengthy for a 'tiel, but there still is one. He said he would just go down to Petco and buy one. I told him to buy two. He asked why, and I told him why two cockatiel would be happier than one. He said he'd buy two. So, rather than try to talk him out of buying a bird, I tried to set him, and the birds he was buying, up for success. But I couldn't just let him take two of our 'tiels and hope for the best. I have a greater responsibility to birds in our charge than to birds in general. Truth is nobody should buy a baby macaw, anyone who is young enough to possibly outlive a macaw is not old enough to care for a parrot. Regards seniors with parrots.... A newly retired bird enthusiast might be the perfect match for an ageing 20 plus meyers, senegal or cockatiel parrot. You can't lump seniors together. There are many of the same age who have different ability. Some seniors have thin skin and could not even hold a parrot on their arm. I know seniors who forget to feed themselves. Cage cleaning would be an effort for them. I have a 90 year old aunt who was still going strong at 85. She is slower now. I am 67 and was diagnosed auto immune at the age of 44. I face each day on it's own merits. If I have a slow witted day or a clumsy one then one of my kids take care of me and my animals. My critters including bird know them and claim them as family. Rainbow yells "c'mere Chuck c'mere" then tries to bit his toes. Myrtle is like a bratty little sister to Rachel and will bite her for the fun of it. (not hard). When I am not here they both claim both of the kids. I regret that we did not suggest fostering to the 70 year old woman who's daughter said she would not take care of a parrot when she died. I can't imagine anyone being that mean to their mother. Oh well. That is my 2 cents. First of all, don't shoot the messenger, I only posted the article, I did not write it! I post all kinds of things related to parrots but it doesn't mean I agree with all the premises on them. I am a senior too and I have parrots but an article like this one is like a law in a way, it's meant for the percentage of people who will not do well on their own. When it comes to seniors, it's not only that even a cockatiel will outlive most of them, it's a lot of things... It is health, as Dana stated, thin skin, blood thinners, etc. It is the physical capacity to keep up with the cleaning, I can't scrub their cages any longer because of my hands, my husband has to do it. It's the fact that seniors tend to be set in their ways and reluctant to change their habits and, when it comes to birds, you can't afford to have a rigid mind, you need to be VERY open-minded and to do research all the time [something that most seniors don't do - geez, A LOT of them can't even use the internet properly or even an IPhone -and this last one goes for me! ]. And I think that the last one is the one that worries me the most about old people getting birds. I am an old person and I was taught all the wrong things about how to keep a bird properly. It was 'put it in a cage, give it water, seeds and an occasional piece of apple and lettuce' and call it a day! Old people don't really eat well (and I will be the first one to admit that I am one of those! ], they tend to have very low incomes and trouble learning and adapting as well as a very short life expectancy - all things that are detrimental to a parrot proper care. Personally, I think that old people should not get any young animals - not puppies, not kittens and, most definitely, NOT a baby bird - but I would have no problem with an old person who is still mentally sharp, physically active, with a relatively good income AND a safety 'human help' net adopting an older animal.